SoftMachine.net | So you want a website. Here’s what you need to know. So you want a website. Here’s what you need to know. I’ve been helping people set up websites for over 20 years now, and although a lot has changed in that time, some basic steps remain the same. So if you want to set up a website give me a call. There’s a contact form at the end of this article. Meanwhile, here are the three basic things you need to do with a few details on each. Registration of a domain name only lasts a year . You have it for a year and are reminded when the year is up and it’s time to pay for another year. What comes after the dot is usually determined by the function of your website. I recently set up a residents association website with a .org address. the most common names are .co.uk for mainly UK interest sites or .com if you are or want to look global. I’ll explain the difference between these and how they might impact on what you want to achieve in another post. Some people register a domain name just so they can use it as an email service, others just for web services. If you want the world to see your website you need to buy a hosting service. This is akin to a virtual always-online computer. This gives you the same kinds of functions your computer has, but connected to the world: memory, processor, hard disk space, bandwidth. Take a look at the column picture below to see what I’m going on about. Then you need a method of accessing the rented virtual computer. Cpanel (see pic below) is the most common way you control your hosting services. 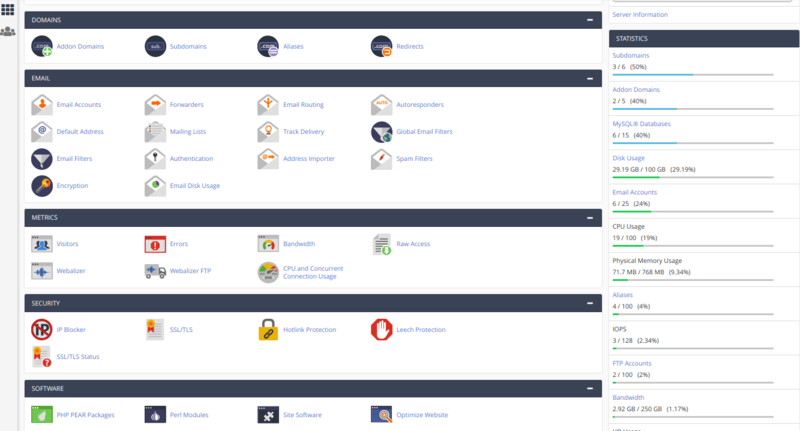 The Cpanel is where you can create email addresses, manage spam filters, databases and other functions. You shouldn’t need to use the Cpanel that much as the design and update of your website happens through other more user-friendly applications that let you focus on the look, feel and behaviour of your website while it takes care of the more technical functions and services you see on the Cpanel. The third and final thing you need to do is design your website. There are a lot of web design applications out there to help you with this. The most popular ones are WordPress, SquareSpace and Wix. There are others out there., The most I’ve seen adverts for on the web are SquareSpace. You may have also heard adverts for them on podcasts. They all provide tools and templates to help you get the look, feel and functionality you want. Still want to go all DIY? Okay. there are lots of companies out there that give you a free domain, cheap hosting for a year and web design apps. If you decide to take this course of action proceed with caution. These options may be good for a personal website but are not suitable for anyone running a business or who want to set up a feature rich site, engage visitors or generate lots of traffic. This is because of the limited amount of hosting resources (see image) that come with cheaper packages. This will impact on the success of your website. Personally I use and recommend Zen Internet for the whole package. They are UK based and it’s very quick and easy to get through to all departments, even technical support. I get nothing for recommending them or if you purchase from them. I recommend them because they are a quality, great value service and always come out top in lots of reviews, including Which! All said and done, best of luck. or use the form below to get in touch if you want to offload the work and commission me to bring your website to life. I’m pretty inexpensive and will help you quickly get up to speed on running everything yourself stress-free and happy.